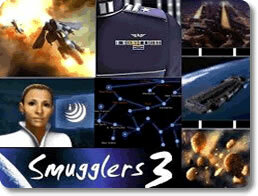 Smugglers 3 Game - Download and Play Free Version! Immerse Yourself in a World of Smuggling, Mercenaries, and Galactic Warfare! You Decide the Course of Intergalactic History in Smugglers 3! 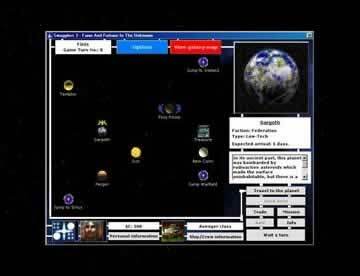 The award-winning science-fiction trading game Smugglers 3 puts you in the middle of an intergalactic civil war between aggressive factions. You decide your own fate in this futuristic battle for glory. Join forces with one of four factions including The Federation, The Outer Rim Alliance, The Syndicate and The Coalition. These warring factions all have distinct differences and monopolies on upgrades so choose wisely. Smugglers 3 Puts You in Command! Become a wold-class military general or a lead rebels against the corruption of the empire in this vast galaxy of 75 different planets and 25 systems. Which factions to align with, which ones to fight and which factions to ignore are all up to you so be careful. Be a part of a rich story lines with depth and development that will amaze you for hours. You can decide to trade peacefully or battle your way to glory, but all decisions come with consequences. Smugglers 3 is For Serious Gamers! Uncover secret spots, hidden treasures, spies, VIP travelers and alien artifacts in this fast-paced game with a quick, intuitive interface. Don't underestimate the complexity of the game because Smugglers 3 is an intense intergalactic economy that you have to make sense of. It's simple, but highly addictive. Don't Worry If You're New to the Game! Smugglers 3 features a second-chance system that awards you "Life Points" every time you reach an achievement or get a promotion and these allow you to play again and again without having to repeat gameplay. To save your games just dock into a planet and click the save game button. Customize Your Ship, Your Crew, Your Cargo and Much More! In Smugglers 3 just about everything can be upgraded or customized. Improve your ship's weaponry to defend against attackers or raid other ships or upgrade your cargo bay to hold more goods. Rise to the Top Ranks! Reach your goals and complete enough missions and you can get promoted, receive medals and campaign ribbons and be rewarded upgrades. Every promotion or award you receive also gives you "Life Points" which will prolong your gaming experience. Be In the Heat of Battle! You actually battle other vessels and factions in space in Smugglers 3. It's up to you to be stocked full of ammunition and choose which weapons to fire at the various invading ships. If you are a serious gamer looking for a battle-heavy intergalactic trading game, download Smugglers 3! Work with or against four different factions all with completetly different uniforms and medals (depending on your success you can pin rank signs, ribbons and medals on your proud chest). You influence the course of war! Its up to you to capture entire sectors through brute strength or cunning strategy. Find secret locations on the map (like hidden treasures, spy ships, VIP traders, alien artifacts...). 25 star systems with over 75 planets! Visit your favorite planets or discover some new systems. New and beautiful planet art. 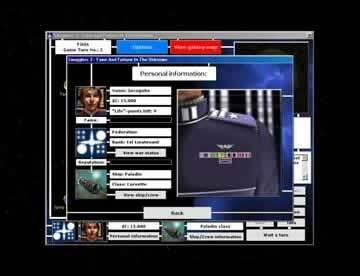 Watch some of the game basics like traveling to planets, buying ship upgrades and new ships, and fighting.